Boy, if there isn’t a whole lot of junk out there on the Web! But there’s also a lot of good stuff. Unfortunately, finding the good stuff can be difficult. So much of that junk just gets in the way. Even if you’ve found a blog (or blogs) you like to read, you might be spending too much time sifting through articles that are of no real interest to you. At some point, you probably give up. This article is for people who read blogs. 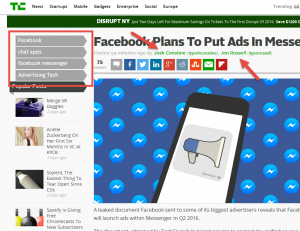 A blogger who effectively utilizes Categories and Tags to group articles by topics of potential interest — and whose public-facing blog properly displays Category and Tag information — is making it easier for you, the reader, to find, read, watch, listen to, enjoy, and learn from his or her content. If you know how to use that information about Categories and Tags to your benefit, you’ll spend less time clicking away from stuff you don’t care about and more time consuming stuff that matters to you. If you read blogs — even if (or perhaps especially if) only occasionally — here are some tips that might make your blog-surfing time more efficient and rewarding. 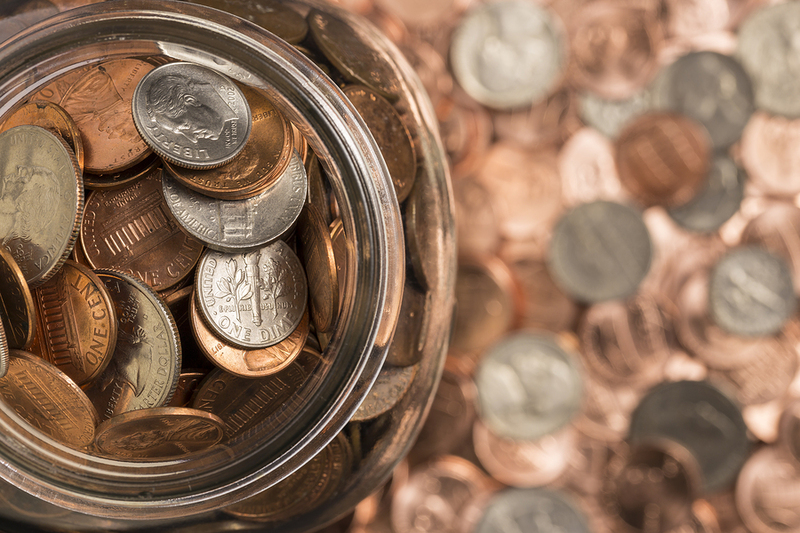 If you know how to use that information about Categories and Tags to your benefit, you’ll spend less time clicking away from stuff you don’t care about and more time consuming stuff that matters to you. 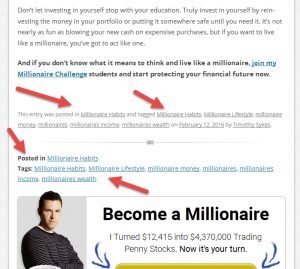 A blog archive is a page, or more often a series of pages, that aggregates articles that have something in common. Typically, that "something" is either the author, the publication date (usually the publication month, but there are other options), a category, and a tag. The format of an archive page is customizable; it could simply list articles by blog title (with hyperlinks to the full articles), but it could also display an excerpt of each article or even the full content of each article. An author archive will list all articles by an author. 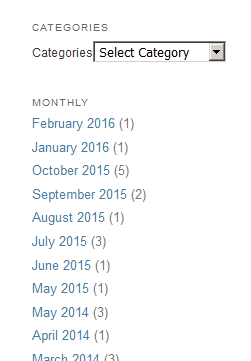 A date archive will list all articles published on the given date (or date range). 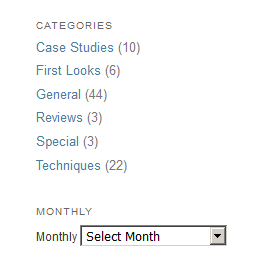 A category archive will list all articles assigned a given category. 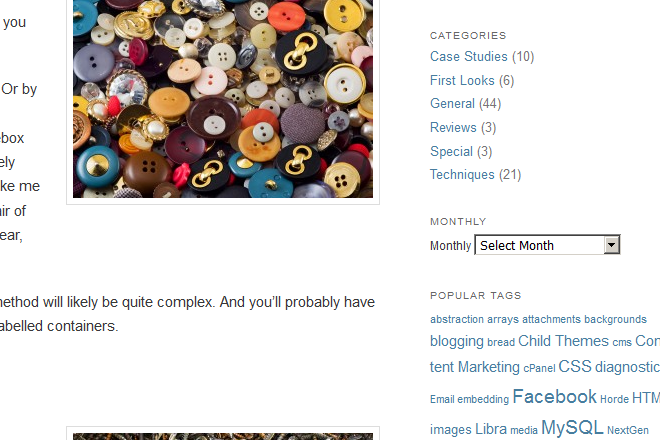 And a tag archive will list all articles assigned a given tag. 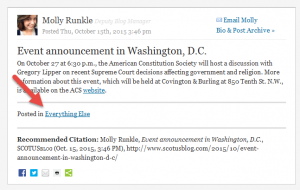 By default and convention, many blogs display links to archive pages in their sidebars. Typically, those archives are Date, Category, and Tag. Date archive listings are often displayed either as lists of dates (again, usuallly year-months) or a dropdown menu of those dates. Category archive listings are often displayed either as lists of categories or a dropdown menu of categories. 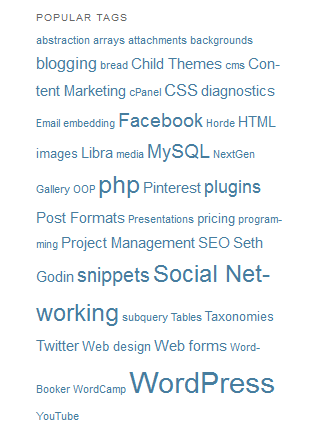 The tag archive listing might be displayed as a "Tag Cloud" — a special type of word cloud in which the font-size of a given tag word or phrase is proportional to the number of articles to which it is assigned. 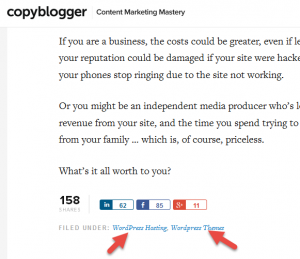 The tag words (or phrases) are hyperlinked so that clicking on a tag word or phrase takes you to the archive page for that tag. But there are often other places from which a clued-in reader can navigate to an archive of articles of interest. Whether these other places exist and where they exist are entirely dependent on how the public-facing blog (in WordPress and other platforms, the theme) is laid out. 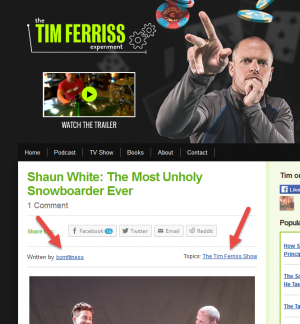 The following screen shots display how this is done on different blogs. Bottom of blog post. “Filed Under” typically refers to Categories. Here, Copyblogger assigned two categories to the post. Click on either term, and you’d land on its archive page. 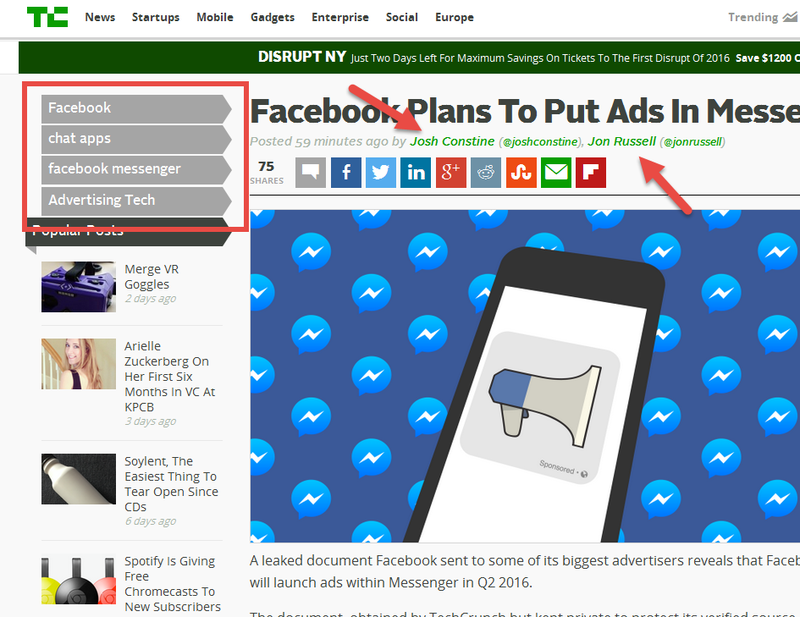 Inventive way to show tags (on left, in red box). Links to two author archive pages under title. 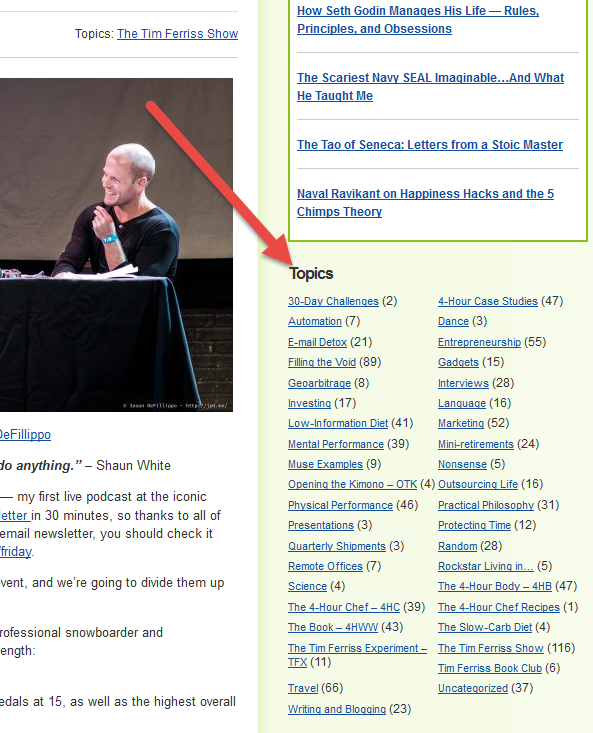 Sidebar listing of all categories (Tim Ferris calls them “Topics”). 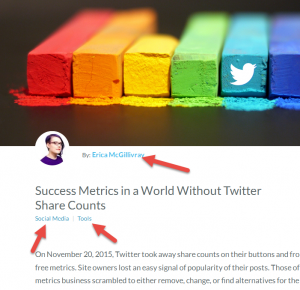 Hyperlinks lead to respective archive pages. Bottom of blog post. Total overkill, if you ask me. And counterproductive. Not only does he display Categories and Tags in two places, but he’s duplicating all over the place. 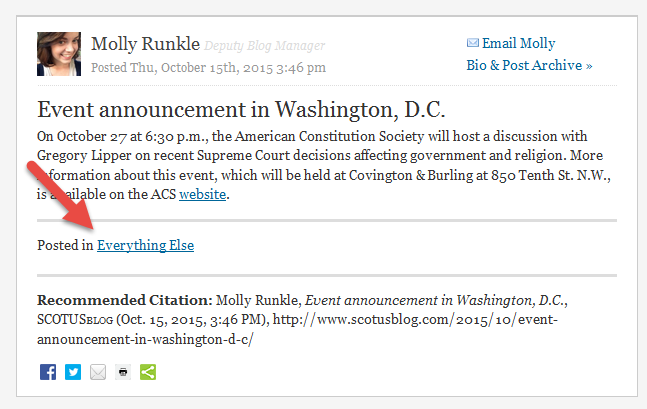 Bottom of blog post at SCOTUSBLOG.com. Category “Everything Else”. 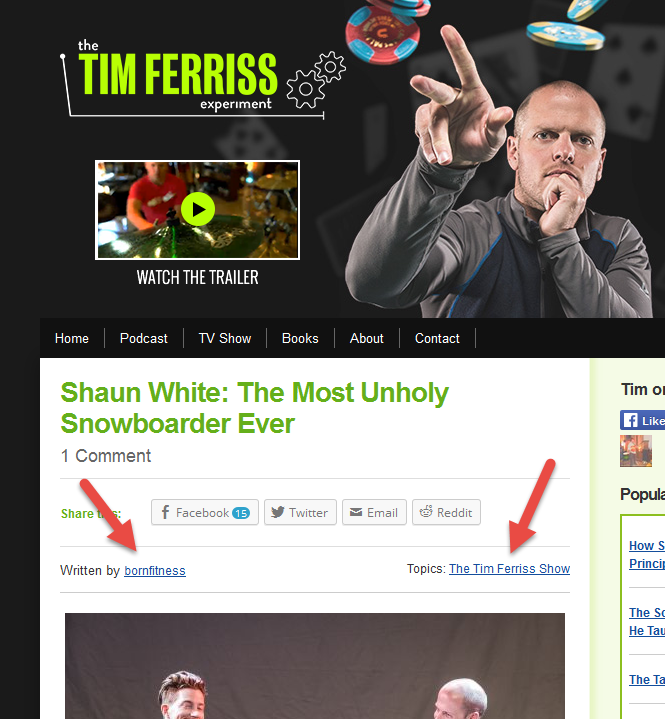 Top of blog post. Link to author archives and two separate categories. Look for links to archive pages for topics (categories and tags) of interest or (in the case of multi-author blogs) authors, and your blog-reading experience might be greatly improved. Helpful! As always, Jeff’s insights and practical tips help improve the quality of my online time. No one makes more sense then you when writing about blogs and tags. Always easy to understand and digest. Keep sharing the wisdom!